Did An ET Knock On China’s Space Capsule? Sometimes, when the gringa is home alone at night, or early in the morning after the caveman leaves for work, my imagination goes into overdrive. I get a little spooked. Should an unexpected noise be heard, that’s it. No sleep for the gringa. But what if you were an astronaut, adrift in the vacuum of space, surrounded by nothingness for thousands of lightyears yet “something” came a-knocking? I tell ya, the gringa would probably die of fright! There’s certainly no hope for fear to disappear when the sun comes up. No waiting around for the hubby to get back. No paranoid call to 911 for the comfort of a first responder to do a quick looksie around. Nope, an astronaut is all alone for the duration of the mission wondering what the heck just knocked on the door and when or if it’s coming back. Guess what? That actually happened. Word has it that, back in 2003, when China’s first astronaut in space, Yang Liwei, was performing a 21-hour tour-of-duty aboard Shenzhen 5, something came knocking. He described the noise like the sound of a wooden hammer hitting against a metal bucket. So, he wasn’t spooked by a few creaks or phantom noises created in an over-active imagination like the gringa’s. He described a very distinct, and distinctly loud, noise. If one eyewitness account of such is not enough for the skeptic, there were other Chinese astronauts who also reported the same banging noise. Consecutive missions, Shenzhou 6 and 7, had astronauts returning to Earth and sharing this news in their de-briefings. The gringa believes it would be the opportunity of a lifetime to travel into space. Imagine the prestige an astronaut must be looking forward to when they get the news that they are slated for a mission. Certainly they envision a future shaped by this achievement. Success is at hand. With respect to their career, they have, indeed, arrived. How, then, must it come to them as a terrible disappointment to realize that they will forever be haunted by their space experience. Do some astronauts return to an Earth-bound life, riddled with anxiety, swept up in paranoia that they are stalked by other-worldly watchers? Do they spend the rest of their life feeling a coward’s shame because they didn’t have the guts to answer the door and see who was there? When interviewed by journalists from Xinhua, Astronaut Liwei explained some of these very emotions. He recounted that when he would hear the knocking, he would become very tense. The gringa thinks, “Yeah. I bet!” He would peek outside the windows only to see nothing. Returning to Earth he spent much time with researchers trying to replicate the noise with a variety of instruments and materials. But they were unsuccessful. As crews for Shenzhou 6 and 7 were preparing, Liwie warned them that they should expect to hear the noise. He tried to put their minds at ease, assuring them that the noise must be a normal, natural phenomenon. But was Liwie telling the truth or making up a comfortable lie? The Shenzhou spacecrafts are classified as cargo vessels. The craft’s name translates roughly into “magic boat” or “divine vessel of god”. When the craft was first put into use in 1999 by China it was an unmanned vessel. After several successful unmanned missions, Astronaut Yang Liwei achieved the first successful manned mission October 15, 2003, completing 14 orbits around Earth within 21 hours. The 2 manned missions that followed also reported back the strange noises. Could this be why the 2011 mission was unmanned except for 2 test dummies? In 2012 manned missions resumed with a 3-person crew delivered to China’s Tiangong-1 space station in 2012, 2013 and a final mission in 2016 delivering crewmembers to China’s Tiangong-2 space station. One more mission is slated for 2018 but no details are yet available on whether it will be manned or not. The spaceship’s technology has roots in Russia’s Soyuz technology. The modified Chinese version features 3 modules. Upon returning to Earth, only one module, the re-entry module, makes the return trip. That means that 2 modules, the orbital and service modules, do not have the same bulky heat shielding as the re-entry module. The orbital module is constructed of aluminum. This is where the crew spends most of their time. If a piece of space debris came into contact with the outside of the module, it would probably make quite a noise. But would a piece of debris make a single contact noise or might it bump around the perimeter of the craft a few times until it went on its merry way? Would a tiny bit of space junk, too small to see out a porthole make a noise as loud as Liwie described? Could the spacecraft survive an impact with a small piece of space debris? How likely is it that this is the source of the noise? Yes, the gringa is filled with questions. NASA estimates more than half a million bits of space junk are floating around Earth. They can travel as fast as 17,500 mph. Even a pebble-sized bit of debris can wreak havoc and cause quite a bit of damage. Check out this picture provided by the European Space Agency (ESA). A solar array on satellite Sentinel-1A took a hit from a tiny bit of space junk (about a 1 millimeter bit) and it punched an enormous hole in one of the solar panels. The size of the damage was about 100 times the size of the junk that hit it. In 2014, just 6 years after the last Shenzhou mission with a crewmember reporting the strange knocking noises, an important book was published. In “Forging China’s Military Might” much of the material discusses the nation’s space program. It is proposed that spacecraft design should feature a “bumper” to absorb meteor and space junk impacts. 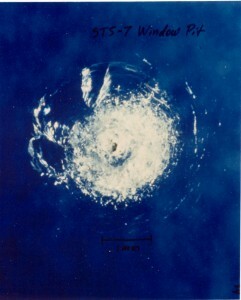 Proving the point that even micro-debris can be deadly, the author points to the Space Shuttle Challenger 7 mission. A tiny fragment of debris, and when the gringa says tiny, she means tiny, the debris was a FLECK OF PAINT… it caused so much damage the entire window had to be replaced. So, did Liwie hear an ET knocking on his spaceship door? Probably not. It’s more likely that it was a bit of cosmic rubble knocking about. Posted on June 9, 2017 June 8, 2017 Categories Astronaut, Astronomy, China, Education, extra terrestrial, Homeschool, mystery, school, Science, Space, Space Exploration, spacecraft, technology, UncategorizedTags astronaut, China, Education, et, gringa, nasa, science, space, technology, ufo4 Comments on Did An ET Knock On China’s Space Capsule? What Really Is Out There? Just about everyone, at some point, has asked themselves the question, “Are we alone in the universe?” Although most people are satisfied to follow up this question with non-committal discussions, others take it much farther. There are those, like the gringa, whose insatiable curiosity simply must be satisfied. You see, the curious types like myself are the people who walk up every single aisle in the grocery store even though their shopping list may only have four items on it. We simply must exhaust every possibility! Say Cheese! James McDivitt, a NASA engineer and astronaut during the 60s, claimed that he filmed a UFO. The episode entitled “Something Out There” recounts his story. McDivitt served on mission Gemini 4, June 3-7, 1965. The Gemini 4 space capsule was orbiting Earth. McDivitt recounts that fellow Astronaut Ed White was sleeping as they drifted. Engines were off and instruments powered down. The gringa then supposes that McDivitt was probably quite bored. No one to talk to and nothing else to do. Of course he was watching the scenery pass by. And, suddenly, he claimed that a cylindrical white object appeared. Because he lacked any reference point for distance, he could not even guess at its size. However, being a well-trained astronaut, McDivitt did not remain frozen in awe, wonder and fear. He grabbed a camera and began filming. NASA will naturally dismisses it as space debris. You can look at the old footage and decide for yourself. Thousands of objects detected by the Hubble Space Telescope that travel faster than the speed of light. Antananarivo, Madagascar, August 16, 1954, around 5pm, hundreds of thousands of people witnessed a UFO described as an “electric green ball” descending from the sky near the Palais de la Reine. Among the witnesses was Air France military officer Edmond Campagnac and an Air France technical director. They testified that the UFO seemed to be at an altitude of about 50-150 meters, resembled a plasma shaped lens, was about 40 meters long, comparable in size to a DC4 aircraft, disappeared behind a hill and then an explosion was heard. A silvery metallic object flew behind it, was about the same size and produced blue exhaust flames. Both were completely silent. As the craft passed over, power outages were experienced but quickly resumed. Dogs were howling like crazy and other animals exhibited signs of panic. As the craft traveled over a farm, herds of animals were seized with panic and began to stampede in different directions. Is Venus where the ancient ancestors of Earthlings are from? NASA says if the right ingredients are there, an Earth-like civilization on Venus would have been possible billions of years ago. Is there 2,000-year-old evidence that the Earth once had 2 moons? And could we actually have 2 moons right now? Posted on January 29, 2017 January 25, 2017 Categories Astronomy, conspiracy, Education, extra terrestrial, Homeschool, mystery, NASA, school, Science, Solar System, Space, Space Exploration, technology, ufo, UncategorizedTags conspiracy, et, gringa, nasa, science, space, ufo, Universe2 Comments on What Really Is Out There? With so much space travel and money spent to expand capabilities, as well as governments all over the world sending out signals to who knows what kind of alien civilizations, have world governments actually thought this thing through? The gringa understands the sense of adventure and curiosity that compels humanity to explore outer space and search for other life. However, does anyone really expect us to make contact with intelligent life anytime soon? Has there been any official policy or guidelines that mankind has decided we must prescribe to? After all, if they really are searching for extra-terrestrial life, surely they are planning for all possibilities, no matter how remote. When NASA was planning its Apollo 11 mission to the Moon, the U.S. thought ahead to the possibility of alien contact that might result in astronauts bringing back home unknown, and potentially dangerous, pathogens. This led to the adoption of a federal law commonly called the “Extra-Terrestrial Exposure Law”, Title 14, Section 1211 of the Code of Federal Regulations (CFR). Basically, if any of the astronauts (or any Earthling for that matter) came into contact with a form of biological alien life, plant or animal, they were not allowed to touch it. Even if the alien was contained within an “atmospheric envelope” (the gringa supposes this means some type of spacesuit), the astronauts or any Earthling would be forbidden to touch even this protective “envelope”. The gringa supposes the government didn’t really take the threat too seriously, probably understanding the strong, natural impulse of humans to be curious. Violation of the law only resulted in a maximum penalty of a $5,000 fine and possible jail time of up to one year. After quarantine, that is. The gringa would certainly risk a year in the slammer for a chance to touch or hug a space alien. Now, however, I don’t have to worry about such measures. In 1991 NASA determined the law served no purpose any longer so it is no longer in effect. NASA knows that mankind has already made physical contact with extra-terrestrials and it was no big deal by way of biological contamination. And since this done-away with protocol of banned contact, little else has been done to outlaw human/space alien contact. In fact, the government seems to have gone another direction entirely. Intelligence gathering through remote surveillance (the gringa thinks satellites, International Space Station, sophisticated long-range satellites and probes). Covert visitation for the purpose of evaluating the ETs space vehicles, technology and weapons (ISS, space travel and top-secret military bases). If human capabilities were sufficient for defense, invite ETs for visits closer to Earth to evaluate potential for any hostility (ISS and top-secret military bases). If all goes well, begin exposing presence with low-level approaches of spacecraft that would be visible to terrestrial observers to demonstrate existence as well as establish no hostile intentions. If exposure to the public went well, escalate exposure to as many terrestrial observers as possible. When ET presence is accepted as non-hostile and not disastrous, invite open communication and meetings. Another interesting fact to point out. Eleven years after these guidelines were established, the first reported alien abduction occurred. Betty and Barney Hill, an inter-racial couple politically active in the Civil Rights movement, claimed they were chased by a UFO in New Hampshire. Although neither one had actual memories of an abduction, only of the chase, Betty began having nightmares and some memory fragments of an abduction that began to surface. Through psychiatric help, the couple eventually recalled their alien abduction experience. But did it really happen or were the pair hoping for a bit of celebrity status and media attention to help their cause? With no witnesses to the event, credibility solely falls upon repressed memories resurfacing through hypnosis, which, of itself, is problematic. Mental health professionals now know that it is easy to “plant” suggested “memories” into a person’s mind. Also, consider that for years afterward Betty claimed to have had hundreds of UFO sightings. However, upon investigation, avid UFOlogists who really wanted the Hill’s claims to be true realized that Betty was a bit dense, or, perhaps, near-sighted. It seems she really couldn’t tell the difference between a bright streetlamp at night or a UFO. There is also the fact that the area of New Hampshire at the time of the supposed high-speed UFO chase was actually well-populated. Had Betty and Barney truly been careening down Route 3 with a glowing UFO hot on their tail, surely someone in one of the several towns they would have raced through would have seen something. Surely a highway patrol, sheriff’s deputy or local police officer would have seen something and given chase as well. I mean, there were stop signs and traffic lights they would have had to have blown right through. So, the gringa has rabbit-trailed enough. Back to the original question. Do government’s actually have protocols for making first contact? It seems that they don’t. And, although Barney and Betty’s alien abduction story may have been a hoax, surely the many thousands that are on record in any number of countries around the world can’t all be untrue. Perhaps the reason that there is no government on Earth at all concerned with what we should do in the event of meeting ETs for the first time is because first contact has already been made and it turned out to be no big deal. Well, stranger things have happened!